If you like a Tuna Melt then you will love this Deviled Crab Salad Melt, a truly great sandwich. 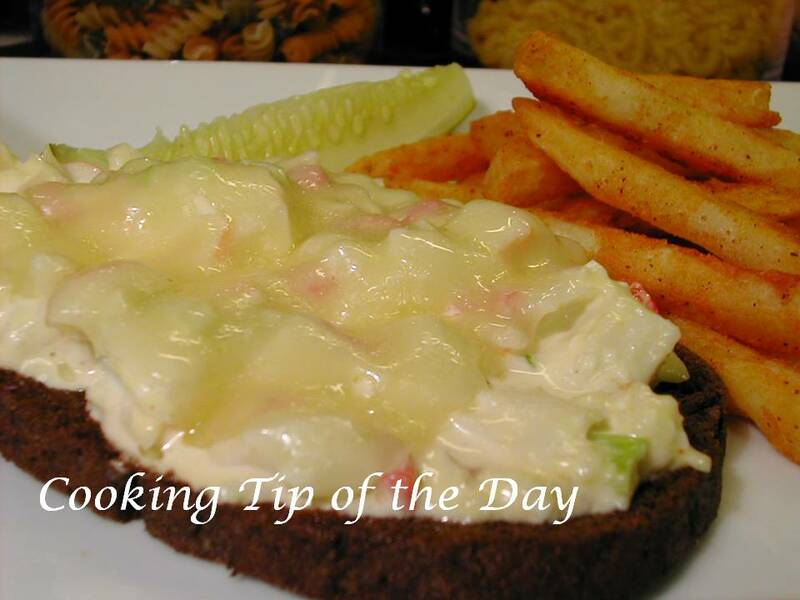 Deviled Crab Salad on pumpernickel bread with melted Swiss on top… all I can say is… yummm! If you don’t have Swiss cheese on hand… cheddar, Colby Jack, American or mozzarella cheese all work well with this also. I love this on pumpernickel, but if pumpernickel is not your thing, then substitute with a bread you prefer. I put a very thin layer of margarine on the bread to keep the salad from making the bread soggy. The Deviled Crab Salad recipe was posted earlier .. click here for the recipe. I served these sandwiches open face with seasoned oven fries and a pickle.. it made a wonderful light supper. Put a thin layer of margarine on the bread. Then put a generous scoop of Deviled Crab Salad on each bread slice. Lay 1-2 slices of cheese on top. Place the sandwiches on a baking sheet and broil for a few minutes until cheese is melted.